Time is flying by so fast that we have not been able to accomplish all of our goals for this year. The good part is that we will have plenty to keep us busy when we return from Florida in the Spring. A special thank you to all the folks that used our guide service this year. We hope you enjoyed your time spent with us, and please consider us, Tennity’s Guide Service & Fishing Charters, in your future fishing plans. The last three trips on Honeoye Lake went quite well. We managed 33 bass on a Thursday, 48 bass on Friday and 25 on Saturday. All fish were released to bite again. Wacky rigs and Texas rigs both caught fish. The colors used depended on water clarity and whether it was sunny or overcast. On Sunday I met a gentleman for a guide trip on Canandaigua Lake. Several bass in the 3 to 4.5 lb. class were caught, mostly on wacky rigs. The total number caught and released was 20 plus or minus one or two. We did not keep an accurate count, but it was a very productive day. Remember to wear your life vest as the water temperature is dropping and hypothermia can happen quickly this time of year. Good fishing, and we will see you in the Spring. It is September 29th and the season is slowly coming to an end. Mixed weather has been a blessing or a curse, and at times make the bass a challenge to locate. Water temperatures drop and then we have several unseasonably warm days, pushing temperatures back up. Confusing conditions for both bass and angler. A couple of days on Conesus produced a few bass and a few pike. Good days, but not up to my expectations. The weather was almost too nice for mid September. Honeoye Lake has been under an algae bloom, but the bass fishing has been quite good. I found that by locating the clearest water, bass could find my offering much better. I also shake the bait, but do not move it horizontally. The vibrations from shaking bait helps a bass locate and strike your presentation. I use 8-10 pound test on spinning rods and 12 pound on bait casting rods. Texas rigged weights are 3/16 ounce, and I match hook size to the bait. 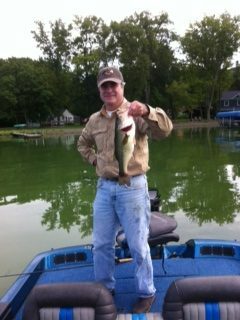 A trip to Canandaigua went very well with several nice bass being caught. The dependable wacky rig worked best. Patience was important. Very clear water and late September mean these bass have seen just about a tackle store full of baits. Since ice out, anglers have been trying to trick them into biting, so a small change in presentation or color can make a huge difference. Baby brush hogs and trick worms worked at all three of the lakes. Zoom makes very good and affordable products. I use other products, but during the year spend several hundred dollars on these Zoom baits because they work. Time is slipping by and soon we will pull the Ranger and docks. Winterize everything and make the long drive to Florida. If you are coming to the Sunshine state, consider a guide bass fishing trip with us in central Florida. Wear your life vest and maintain a proper lookout. It is early September and we have a major algae bloom in progress. Do the bass still bite? The answer is yes. The bloom creates a problem for the bass to eat by sight. It is not that bass are visually impaired, but water conditions limit their distance to see our offerings. I have learned that by shaking the bait in place and limiting the horizontal movement, bass have the ability to locate the bait. Use a bait that has some appendages and it will increase the vibrations, assisting both largemouth and smallmouth to lock in and attack your presentation. Fall patterns are starting, with the bass scattering and some moving quite shallow. Meanwhile, the spinnerbait/buzzbait bite is picking up. Small square bill crank baits will also work again as fish move closer to shore. Water temperatures have cooled to the high 60’s and with cooler weather, will drop more. Docks are being pulled so that pattern will be gone. By covering lots of water, you’ll be rewarded. Good fishing, wear your life vest, maintain a proper lookout. Time is passing us by fast this summer. It is August 8th and Fall is approaching quickly. The water temperature on Honeoye Lake has dropped 4 to 5 degrees in the past week and the bass have been affected. Last Monday the bite was good and my clients had a good time. Tuesday I went to Seneca Lake, and we fished for smallmouth and largemouth bass. We managed 1 nice smallmouth and missed at least 3, all on melon pepper tubes. 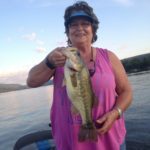 Later when the lake got choppy, we returned to the canal and managed to hook up with several largemouths on Zoom wacky rigged trick worms in watermelon/red. 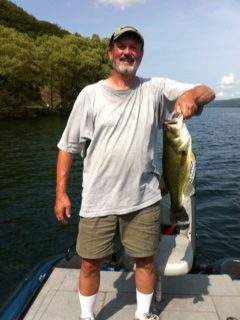 Forwarding to this week, the bass have slowed considerably on Honeoye Lake. Conditions have stabilized and the bite is picking back up. I moved into the heavier weeds and am using baby brush hogs, shaking them, stoping, then shaking some more. It helps the bass locate the bait. The wacky rig is also working, but you have to fish it slow. Red Bug trick worms worked yesterday and today on the rig. Green pumpkin baby brush hogs with a 3/16 ounce weight, Texas rigged was the best producer today. A couple of points to help your success when you go fishing. Learn to pitch, flip and cast. Practice in the yard for a few minutes each day and you will be rewarded. Make every effort to learn how to use a bait casting outfit and an open face spinning reel. These are like tools in a tool box. No one tool is good for all jobs, and neither is a single style of fishing outfit. Last day of July already. Had to go for a random drug test today, part of the USCG regulations. When you receive the paperwork, the next business day is test day. Fishing has been very good ,but catching has been a little bit iffy with the dirty water on Honeoye Lake. The heavy rain made conditions difficult but with hard work bass had to eat. Wacky rigs, baby brush hogs and spinner baits worked. Conesus Lake has also been off with dirty water but it is clearing as of last Saturday. Chatter baits and baby brush hogs fooled a few, but the bite was slow. Keuka Lake, in the Branchport arm was very good last Friday. Wacky rigs, spinner baits and tubes took a mix of LM,Sm, and those toothy critters. Depths were anywhere from shore to 25 ft.
Tucker with his walleye after a day of bass catching. Honeoye Lake has been producing some nice fish this week. Melody managed to catch a nice 4lb. largemouth and Tucker topped off a day of bass fishing with a very good walleye. All fish were caught using Zoom plastic baits. Weather has stabilized and the water temperature is steady. Bass just completed a spawn and are on the bite. When it was raining with overcast skies on Saturday bass were very active. Sunday with bright and sunny conditions slowed things down but you could still catch a nice sack. Melody managed to put a 4 lber. in the boat Sunday evening. A mix of baits worked with wacky worms and baby brush hogs fooling the bass. As usual, the baits were Zoom products. There are many great baits in the marketplace to choose from, but these baits offer 20 per package and a long history of quality with the ability to trick bass into biting. The water temperature has taken a major jump and the bass have responded. Recent rains have stained the lake, but the bass do not care. Fish slow, shake the bait and you will get bit. Zoom trick worms and baby brush hogs have been producing quite well. Color to use will be dictated by the water color. Clear water use your greens and stained water switch to green pumpkin or black. Bass are actively bedding. We have caught several with their tails rubbed flat on the bottom. The bass can be caught in water from a few inches to 10 feet deep. Keep moving in and out until you locate where they are active. Pickerel have also been active. I have caught several nice toothy critters on the bass baits. Most fish have been caught in the 5-7 ft. depths. Be safe, wear your life vest. Honeoye Lake is starting to warm and the bass are reflecting the temperature rise by a huge increase in their activity level. The bite is more predictable and aggressive than it was last week. A mix of baits, from wacky rigged trick worms to Texas rigged baby brush hogs, have both worked well. I rigged a Denny Brauer jig with a zoom trailer and it was quite effective. Keuka Lake presented some challenges as the water is 60 to 61 degrees in the Penn Yan branch. Folks from a neighboring state managed to catch several largemouth, smallmouth, pickerel and a few rock bass. Wacky rigged finesse worms, Bass Pro tubes, and a Stanley spinnerbait all fooled some nice fish. With the water so cool, be sure to fish slow and wear your life jacket.